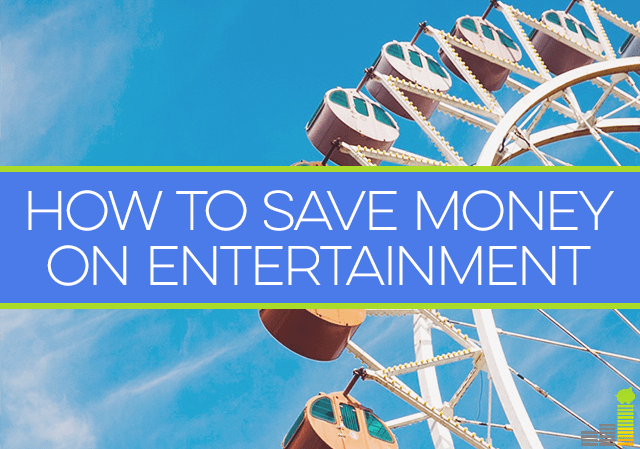 One of the ways we’ve been working hard at finding balance as we pay off debt is by saving where we can, including finding ways to save money on entertainment. When we started our debt payoff journey in January of 2013, our first plan was to spend nothing – zero – on entertainment for our family. That lasted about two weeks before the danger of trashing our budget set in, so we quickly decided that, instead of eliminating our entertainment budget, we’d learn how to make one we could live with. This, in my humble opinion, is extremely important if you want to avoid debt fatigue. 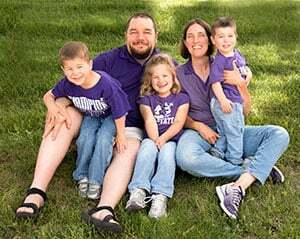 For 2013, we ended up just kind of spending a bit here and there, and our plan to save money on entertainment resulted in an entertainment budget for our family of six of about $74 a month. That’s not bad, but for 2014 we have a new goal of using the envelope system and setting our entertainment limit at $60 a month. This has worked well for us so far. When we see those three twenties staring back at us each month, and we know that “this is it” as far as fun money is concerned, we find it a lot easier to say “no” to those fast food drive thru trips and to save our entertainment monies for something that is truly important to us. 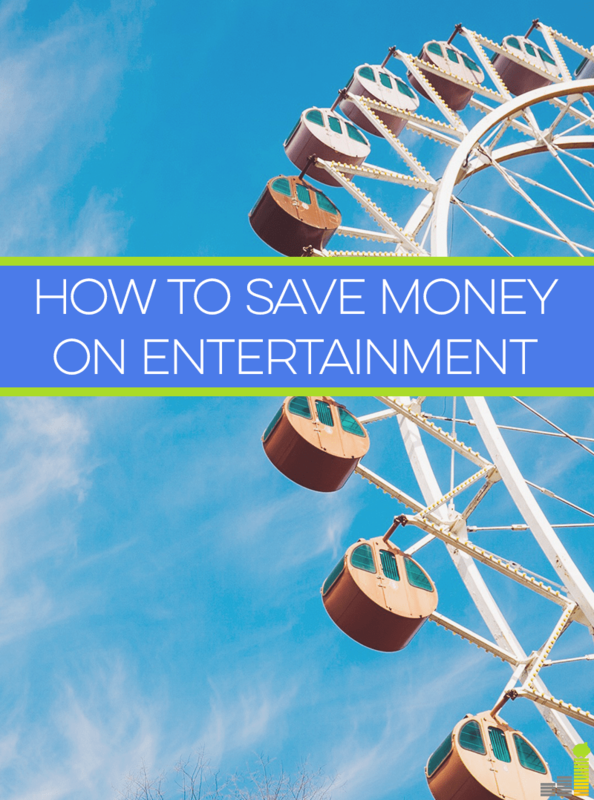 As such, we’ve worked hard at learning how to save money on entertainment, so I thought I’d share some tips with you today that might help you do the same. One of the things we did when we first started learning about how to save money on entertainment costs was to make a list of all of the fun things we like to do. We divided that list into three sections: free stuff, cheap stuff (as in, under $20) and then we added a third list with estimated costs included for stuff that was over $20. On the first section of the list we put things like hiking, biking, picnicking, game nights with friends, etc. The second section would include things like movie rentals from Amazon and fancy or junk food nights that went outside of our typical frugal grocery budget. The third list included more expensive things, or things that were on our dream list, like trips to a waterpark or hotel weekends we book through Expedia. Creating a list of ideas helped us to have ready-entertainment ideas right at our fingertips so that we had choices available that were both within our budget and within our interests. There are all sorts of coupons, deals, and ideas to help you save money on entertainment out there in Internet land. Don’t just go hiking: turn your hike into an archaeological dig and bring a list of things with you that the family can look for on the hike, such as fossils and rare bird or state bird sightings. Invite extended family over for a potluck, and have a slideshow or picture albums out from days long gone. We did this last year and it was a huge hit that is now slated to become an annual gathering. Search your state’s tourist site for lists of cities, towns or historical sites that have free or discounted days, or free town celebrations or parades. There are likely all sorts of things going on not too far from your home that can provide hours of free or cheap entertainment for your family. Some of our favorites? The weekly farmer’s market here, complete with musical entertainment and free samples, the town celebrations at all of the nearby small towns, and free movie days in the summer at a nearby theater. Instead of eating out at your favorite restaurant, save money on entertainment by making a version of their signature dish at home. You can pretty much find any recipe on the Internet these days, or at least some version of it. You can get a movie using your Amazon Fire TV Stick and make some air-popped popcorn with lots of real butter and your favorite soda instead of spending your hard-earned cash at the theater. Have an elegant dinner with friends at your home where each brings an upscale appetizer or dessert and brings a new or unusual bottle of wine instead of heading out for that $100 meal. Instead of a trip to an expensive waterpark, see if you can find a stellar deal at a good local hotel with a pool. It may not be quite the same, but it’ll be something instead of nothing, and let’s face it, entertainment is more about attitude than about what you do. One of the things we’ve found about learning how to save money on entertainment in this way is that we really do have much more fun when we go out. The restaurant trips or movie dates are much more gratifying, because we do them three times a year instead of three times a month. I guess the best way to put it is that we appreciate things more, and the bonus is that we’re saving money in the process. What fun ways have you found to save money on entertainment? What’s one of the best dates or family fun nights you’ve enjoyed recently? love this post Laurie. having some fun money is cruitial. we dont spend a lot on entertainment though the fact that we have a young kid at home sort of restricts what we can do anyway (in terms of time). another thing we do is cash in rewards for nights out. we collect points from a free points service (just a collection card no credit card) and every few months we cash in points for movie passes, gift certificate etc. gives us a “free” night out. I know some people simply need to get out of the house to enjoy themselves, but my idea for saving money is taking advantage of entertainment options that you already have at home. We have a bunch of board games and have had fun inviting others over to play. Also, if you have movies, cable, or something like Netflix of Hulu Plus, you can watch those instead of going out to the movies. Exactly, DC! You really can make fun wherever you want to if you’ve got the right attitude. Board games are the best, aren’t they? One of the great parts of living in a city is how much there is to do for free. There are parks, beaches, events, all things you can do with no or little cost. Of course, it’s a little harder in the winter when you can’t really be outside for too long. We splurged on a $150 annual membership to our Boston’s Children’s Museum, which gets us unlimited access and is a really great place for Aiden to run around an explore. We’ve done that too before, Matt. Also, the Historical Society, at least here, is super cheap for a yearly membership and boasts dozens of places we can go for free. Probably wouldn’t be hugely beneficial to your kids now, but in 5 years it might be something to take advantage of. I really need to take a cooking class or something because I have no idea how to make most of our favorite foods. Or, maybe just look for easy how-to guides on the internet! The Internet is an awesome gold mine of restaurant recipes, Holly. We found our very favorite Turtle Cake recipe from a well-known bakery here on the Net and make it regularly. I made the same mistake when I was paying off my debt years ago too. I went “all in” and tried to spend almost nothing on entertainment. That lasted a very short time before I hated life. You have to find a balance between paying off debt and still living life. Great tip about finding your fav restaurant’s dishes on the internet. We used to love to go to a certain Italian-style chain restaurant because they have a really great soup that we like. We found a recipe on the internet that comes pretty close, and now we can make it whenever we want! We haven’t been to that restaurant in ages. My wife and I have started to frequent the nice museums here. We also were gifted a pass to all of the aquariums around the state, so we now get that for free for a year. We plan on taking our son as he loves fish! That’s a great gift, Grayson! We are planning a trip to a nearby town this summer that features a historic lighthouse. The admission for our family is $42, but instead, we’re getting a yearly historical society pass for $65 that includes admission to the lighthouse, which will grant us lots of other freebies during the year! We are home bodies so we like staying in and watching movies. We don’t go to the theater much as the prices are so crazy and many times too crowded for our taste. One of our favorite things to do is family movie night with popcorn and ice cream sundays. inexpensive, fun AND yummy! The library is a great resource for free stuff and activities. One of our favorites was when there was a presentation from a lady who runs a wolf hybrid rescue, complete with wolf-dogs. This is certainly a challenge in a small town, but out outdoor activities make up for what we lack in amenities. We have great parks and hiking trails that are completely free. Our family likes to go on a trip to the beach every summer with our other relatives, and the good thing about it is that they would split the expenses, that’s we are able to save money while having a great vacation trip. Great tips, entertainment doesn’t have to be that expensive. And I do prefer watching a movie in the comforts of my own home rather than paying an arm and a leg to watch it in the theaters. Maybe if its a movie with special effects, it might be worth it. Living in NYC there are many free or discounted events going on…next week the Super Bowl events will be in Manhattan. It’s important to me to see and support live theatre which is typically very expensive. But I’ll only go if I can get a ticket for $30 or less through lottery, rush, or a discount program. It’s been great this winter because the weather has been causing tons of ticket cancellations and theatres are practically giving seats away to major Broadway shows. Great post, Laurie! Last year, I racked my brain for something to do for our seven-year anniversary. I thought about dinner reservations or a weekend trip, but ultimately the day arrived with no plans. We ended up biking to our downtown area to try a trendy breakfast place and invited the guy (a good friend) who married us to join. Then we bought spices at a local spice shop, rode our bikes around town a bit more and stopped at the local brewery for a pint. We finished off the day eating caprese salad with tomatoes and basil grown in our garden. It was the perfect day and required no planning and much less money than I intended to spend! Kendal, sounds like an absolutely beautiful anniversary celebration! That salad sounds delicious! We’re hoping to put more fresh herbs in our garden this year too. Thanks for sharing your story, Kendal! I like the idea of making a list and maybe making a circle out of it with a spinner so you can quickly decide what to do. My boyfriend and I are so bad at figuring out how to spend our time that we spend more time discussing what to do. We’re generally low key so keeping our entertainment budget down isn’t an issue, but I imagine with kids it’s difficult! Love that idea, E.M.! That would be great for dealing with kids who can’t make up their minds too. 🙂 Yeah, things definitely get more expensive entertainment-wise with the kiddos, but we’re lucky in that they’re grateful kids who are appreciative of whatever we do. I like how you guys segment out free activities and cheap activities. I often forget about free options when date night rolls around, but a free movie in the park (which several towns around here do), with a picnic on a blanket with my wife, would actually be a better date night than the typical restaurant dinner and two tickets to the theater. But without specifically noting free options as an activity to research, I’d miss it. Thanks, Laurie! We love playing board games as a family, and we literally spent three hours the other night playing monopoly that was a Christmas gift for my son. We also have a bank account with Bank of America and we get text alerts on weekends where we can use our ATM card to get into museums for free. It’s not only free but educational for my 7 year old. My entertainment budget is basically about my daughter. We have annual memberships to the zoo and nature & science museums, but we always have extra fun things that we like to do. At 4 years old, she is an amateur artist and likes to paint pottery or canvas at the craft store. It is not much of a budget, but to her excitement and diligence while working is definitely worth it. It is fun to spend money on the kids, isn’t it, Chad? You should keep an eye on that girl, you might have a professional artist on your hands some day! I really like the idea of creating a list of all the fun things we like to do and dividing it into sections. I think this would really help us stay on track for 2014, entertainment is a challenging area for us to stay on budget with – thanks for the suggestions! We’re homebodies for the most part, so my favorite date nights tend to be a pizza (or burrito) which is less than $10 and a Redbox movie (way more comfortable to watch on our couch in house clothes, plus we can pause it for bathroom breaks!). I’m right there with you on that one, Anna. That’s one of our fave date nights too – fun doesn’t have to be spendy! Great post Laurie! 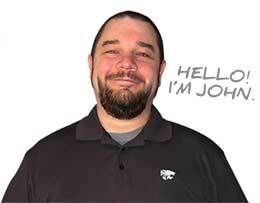 I like your idea about dividing your list into free stuff, cheap stuff and the $20+ stuff. Winters here, with two young kids, make it a little difficult to get out anywhere, that doesn’t involve going to a library, walk a mall, or spending a few dollars at a cheap indoor play park. I can’t wait for spring!!! Well my Roku box is like my boyfriend. I’m thinking of changing my FB status update to “in a relationship with Roku” because there is some much seriously cheap entertainment. Of course I try not to be too much of a hermit, so I play volleyball with friends, and Sat I’m having a potluck and movie night at my house. You just have to think things through a little. I do like to go OUT to the movies, but I save it for movies I REALLY want to see, and have good ratings in rottentomatoes.com. LOL, funny! That’s what we do with movies too, Tonya. We pick two or three a year (my oldest keeps track of all that’s coming out 🙂 ) and wait for the rest to come out on Redbox or whatever. Love the idea of a potluck movie night – we’re having a potluck for the Superbowl next week! Wow, entertainment for a family of six for $60 a month is pretty incredible. We love our local farmer’s market. We can spend a whole afternoon looking at all the produce and picking out a few new things to try. We sometimes share a loaf of bread with tomatoes and cheese, it’s a cheap and fun “date”. Great post Laurie. I love the three category list. Definitely have to make one of those. Keeping frugal options top-of-mind is a great way to keep boredom from running away with the wallet. Jane and I are often busy after work and typically have only the weekends to ourselves. Friday nights used to be our take-out night, but with a bit of internet research we now enjoy some home made dishes. Weekends are a mix of school work (for me..Jane likes to sleep in) and then movies or dvr’ed TV. With some research I bet we can make a great list of local frugal entertainment and try something new without busting the budget. I bet you can, Jack! So many cities and towns have free or cheap goings-on for residents – concerts, movies in the park, or whatever. You’ll have to let us know what you find. We have recently decided to go to the dollar theater in our town. They show movies that are several months old so you have to wait until the current releases make their way there. But it’s much cheaper for a family of six than spending $8+ per person (plus snacks) at the main theaters. Nice way to look at interesting things for the family to do: free, under $20, and over $20. One of my favorite things to do for free is to take a bicycle ride along the edge of the San Francisco Bay, and observe wildlife, or take a hike in the Coastal Mountains and look at the views. Of course, our preteen son balks when I suggest a hike. But I think he actually does enjoy himself once we start observing stuff like lizards on the trail, or looking down at the Silicon Valley below us and mapping out where various landmarks are. We just love hiking and biking. Our 14-year-old gets a bit annoyed at first too, but like you said, she has a great time once we get going. :-)A hike in the Coastal Mountains sounds absolutely beautiful, Bryce! WE like to get outside for entertainment. We used to go to a lot of movies at the theatre, but I realized it never really scratched the entertainment itch; I usually ended up leaving feeling annoyed rather than like I’d had fun. So now we prefer going on hikes. This was really a nice read Laurie, thanks for sharing. I second you regarding the idea of thinking out of the box. In fact, that is what can keep us going, balancing all the financial issues as well as entertainment and preparing the restaurant dishes at home, is a pretty good suggestion. I used to make a leaf book with all sorts of leaves I’d find on the hike and then look them up on a book when going home. We also had a kind of girl scout books showing how to do a little house in the forest, a fire, etc. and would follow that to make manual activities.